Houghton Mifflin Harcourt, 9781328826336, 192pp. Despite, or because of, the racial rage and fear he experiences among white gun owners (“Ain’t you supposed to be shooting a basketball?”), Young determines to get good, really good, with a gun. Let It Bang is the compelling story of the author’s unexpected obsession—he eventually becomes an NRA-certified pistol instructor—and of his deep dive into the heart of America's gun culture: what he sees as the domino effect of white fear, white violence, black fear, rinse, repeat. Young’s original reporting on shadow industries like US Law Shield, which insures and defends people who report having shot someone in self-defense, and on the newly formed National African American Gun Association, gives powerful insight into the dynamic. Through indelible profiles, Young brings us up to the current rocketing rise in gun ownership among black Americans, most notably women. 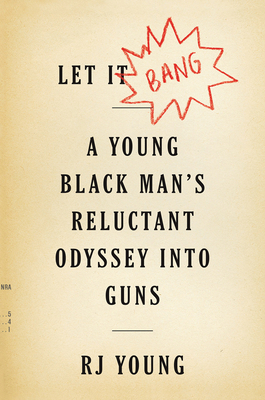 Let It Bang is an utterly original look at American gun culture from the inside, and from the other side—and, most movingly, the story of a young black man's hard-won nonviolent path to self-protection. RJ Young’s writing has appeared in Reuters, the Oklahoman, and USA Today. He is pulled over by the police more often than most white people change their sheets. He lives in Tulsa, Oklahoma. Learn more at rjyoungwrites.com.